I’m a huge movie buff and enjoy films in all genres, regardless of when they were made. Particularly when watching older movies, I have every so often wondered how old the actors were back then. For example: How old was Dustin Hoffman when playing a young student in The Graduate from 1967, and how old is he now? And how old was Eli Wallach when portraying Tuco (The Ugly) in Sergio Leone’s legendary spaghetti western The Good, The Bad and the Ugly? Is Wallach still alive? You would usually have to look up both the movie and the actor on IMDb and then manually calculate the age to get the answer. That’s pretty bothersome, so for fun, I decided to make a website that automates the task: How Old Were the Actors. The website will show you how old the entire main cast was when making the film, how old the actors are now, and whether they’re still alive. How Old Were the Actors will also display information about the movies and provide links to IMDb. As a bonus, the site features a list with all the oldest actors in the world. Among the popular Hollywood actors, Eli Wallach (97), Kirk Douglas (96) and Mickey Rooney (92) have been on this planet the longest. 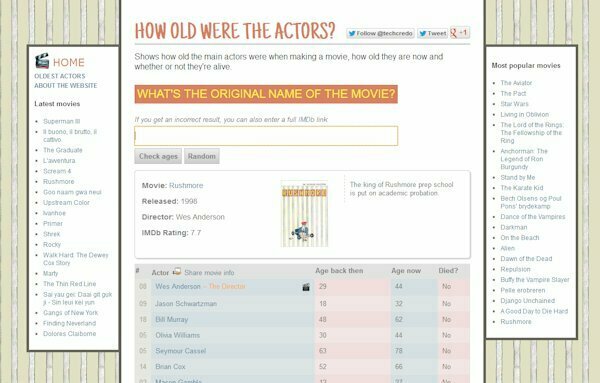 You can visit How Old Were the Actors at the following URL if you want to check it out: http://asmoothsea.com/actorsage/. Informative commentary – I Appreciate the points – Does someone know where my company might access a sample IRS 5558 version to type on ?